In recent years, the news media have followed their audience’s lead and gone mobile, working to make their reporting accessible to the roughly seven-in-ten American adults who own a smartphone. With both a smaller screen size and an audience more apt to be dipping in and out of news, many question what kind of news content will prevail. This is not to say that all long-form news accomplishes the above or that short-form does not have its own value. But, in a news environment so dramatically different from past forms, the question is worth exploring: Will people engage with lengthy news content on their phones? A unique, new study of online reader behavior by Pew Research Center, conducted in association with the John S. and James L. Knight Foundation, addresses this question from the angle of time spent with long- versus short-form news. It suggests the answer is yes: When it comes to the relative time consumers spend with this content, long-form journalism does have a place in today’s mobile-centric society. To understand how mobile users interact with news, the study utilized audience behavior metrics provided by the web analytics firm Parse.ly, a company that supplies real-time and historical analytics to a broad mix of digital publishers, including over 170 top media companies. All told, Center researchers spent months digging deeply into the details of 117 million anonymized, complete cellphone interactions with 74,840 articles from 30 news websites in the month of September 2015. While 123 seconds – or just over two minutes – may not seem long, and a far cry from the idealized vision of citizens settling in with the morning newspaper, two minutes is far longer than most local television news stories today. And that print newspaper over which people linger contains many separate stories, not just one. In addition, our analysis indicates that this metric almost certainly underestimates the real time spent reading or watching a news story. Specifically, the Parse.ly metrics capture screen movements such as scrolling or clicking, within 5.5 second intervals. While more precise counts of actual user engaged time may still be out of reach with existing methods, what is of most value is the relative difference that emerges between long- and short-form stories. And here the conclusion across this dataset is consistent: People are spending more time on longer stories than on shorter ones, suggesting that engagement can expand to meet the demands of a more in-depth piece. The data also reveal that while shorter news content is far more prevalent than long-form and thus draws more total traffic, long-form articles are accessed at nearly the same rate. Fully 76% of the articles studied were fewer than 1,000 words in length. But, article for article, long-form stories attract visitors at nearly the same rate as short-form: 1,530 complete interactions per long-form article and 1,576 per short-form. Across all five distinct parts of the day, readers spend about twice the time with long-form news content on their cellphones as with short-form. For both story lengths, they spend the longest average engaged time in the late night and morning hours: 128 seconds late at night for stories 1,000 words or longer and 60 seconds for stories shorter than 1,000 words. In the morning, the figures are 126 seconds and 59 seconds, respectively. 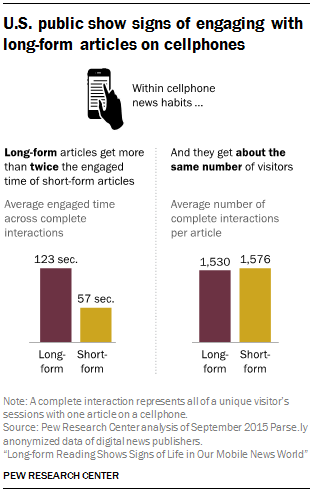 The gap between long- and short-form engaged time also persists across all five ways visitors can arrive at news articles (such as through a link from an external website, social media, search etc.) – though those who follow a link on their phone from within the same website spend the greatest amount of time with an article. Long-form news readers spend an average of 148 seconds with a news article when arriving there from an internal link. That falls to 132 seconds for those who visit the article directly or follow an email link, 125 when arriving from an external website, 119 from search and 111 from social media. For short-form reading, the average times are lower but social media is again at the bottom. Nonetheless, social media sites drive the largest share of traffic overall – accounting for roughly 40% of cellphone visitors to both short- and long-form news. There are some noteworthy differences in the nature of the visits coming from two of the larger social networking sites – Facebook and Twitter. While Facebook drives more traffic, Twitter tends to bring in people who spend more time with content. For longer content, users that arrive from Facebook spend an average of 107 seconds, compared with 133 seconds when they come from Twitter. The same pattern emerges with shorter content: Those arriving from Twitter spend more time with that content (58 seconds) compared with those coming from Facebook (51 seconds). Yet, for both short- and long-form content, Facebook referrals drive about eight-in-ten initial visits from social media sources, while Twitter drives about 15%. Just a small fraction of users who access either a short- (3%) or long-form (4%) news story on their phone return to it on that phone, but those who do tend to spend more time with it than users overall. 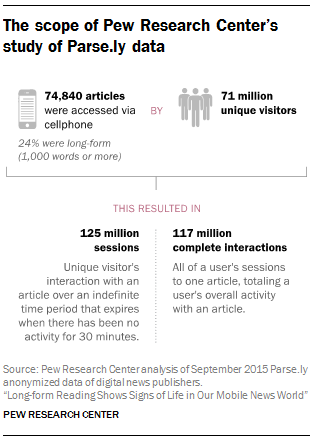 Return visitors to long-form articles spent 277 seconds with the article compared with 123 seconds for users overall. For short-form content, return visitors spent an average of 110 seconds of engaged time with the article compared with 57 seconds for users overall. Both long- and short-form news articles tend to have a very brief life span. Fully 82% of interactions with short-form articles begin within the first two days after publication, as did 74% of long-form interactions. By day three, that rises to 89% of short-form interactions and 83% of long-form interactions. An overwhelming majority of both long-form readers (72%) and short-form readers (79%) view just one article on a given site over the course of a month on their cellphone. Users who visited at least one long-form article are somewhat more likely to view multiple articles on their cellphone than those who initially accessed a short-form article, but the numbers for both are small: 28% and 21% respectively. Working with large, organic datasets like the one for this project require, at the outset, critical structural and methodological decisions, as well as data organization and cleaning. This includes developing an in-depth understanding of how the data are collected, recorded, and structured and what research questions the data speak to most clearly. An in-depth discussion of the methodology behind this study can be found here. There is also a glossary of the terms and measures referred to throughout this report. Readers can click a glossary term any time it appears to review the terminology.